This incident is sure to shock and question yourself on how much humanity is left, after a young father from China left his daughter in a restaurant as he did not have enough money to pay for the meal. The incident took place in Foshan region of Guangdong in Southern China. 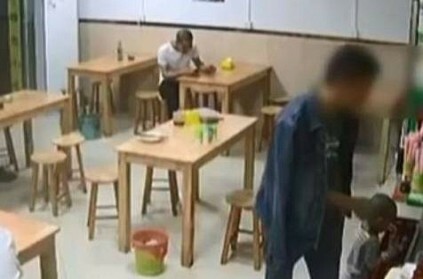 This inhuman video was caught on CCTV cameras and has gone viral on social media platforms, where the man decided to leave behind his own two-year-old daughter as he was falling short of 1 yuan (Rs 10) of the food that costs 6 yuan (Rs 62). In the horrifying video, the man is seen walking out of the restaurant as the girl cries loudly and run towards him. The father is also seen pushing the little girl back into the shop as he attempts to leave without her. According to Daily Mail, he told the restaurant owner that he would redeem the child the next day. "I am going to leave her here as a pawn. I'll come back tomorrow with cash and get her." After the child's father left the restaurant, the owner fed the crying child, "We sat the girl down in the kitchen and gave her a bottle of soy milk." According to a Chinese media report- Sothern Television Guangdong, as the restaurant owner couldn't find the man, they informed the police regarding the issue. The man later returned to the place and was shocked that his daughter was not there. The man then went to the police who gave him a stern warning for his act. Meanwhile, Huang Zhenyu of the Shunde district police said that, "The man insisted he wasn't abandoning his daughter and was just trying to get some cash. It took him a long time to return because his electric scooter ran out of battery and he had to wait for it to charge". ‘நச்சுக் காற்றால் நாடே அவதிப்படும் கொடூரம்’.. தொழிற்சாலை மூடப்படுமா? டார்கெட் அச்சீவ் பண்ணலன்னு இவ்வளவு இழிவான தண்டனையா?’.. கார்ப்பரேட் நிறுவனம் அதிரடி! ரொம்ப கோவம் வருதா? அப்ப அடிச்சு நொறுக்குங்க.. அதுக்கு ஒரு கடையையே திறந்த நபர்! வெச்சு செஞ்ச சலூன்காரர்.. யூ-டியூப் வீடியோவால் ‘தலை’க்கு வந்த சோதனை! This page contains news relating to various facts and events. The views are generally about current affiars and general topics in diversified areas such as political, international, national, and regional issues, sports, health, travel, lifestyle, technology and business. People having similar interets on the above topics will find this page useful. Chinese Father Pawns Two-year-old Daughter to Restaurant As He could n | World News.